Can you see the end of this lava runway? Small red cones on the lava mark it. That's the runway off to the left marked with more red cones... just a smoothed spot in all that lava! 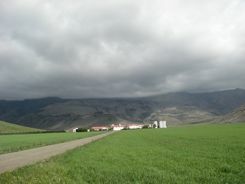 The Eyjafjallajokull volcano hid behind clouds. 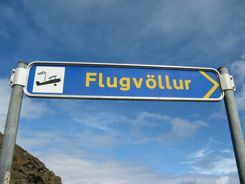 We thought the "Flugvollur" signs that pointed out the airports in Iceland were just plane fun... whether it was a paved strip, a grass strip... or a lava strip! We drove around the south of the island and found this lava runway. 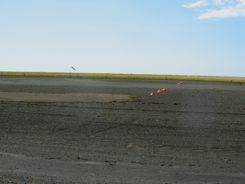 OK it might be a little hard to see this, but that's a windsock and red cones marking the end of the runway. And in the shot with our car, that's the runway off to the left... again lava marked with red cones. 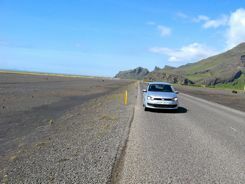 It's near that Eyjafjallajokull volcano that caused all the havoc this Spring 2010. They've rolled the lava smooth... for sightseeing? 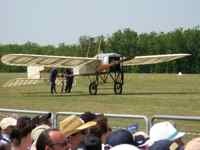 For scientific flights? We don't know. I think you'd really have to know where the runway was to spot it... there was a lot of black rock and pumice where that eruption spewed out all that ash. We didn't see any planes land on it, and we didn't even get to see Eyjafjallajokull... The photo we have is of the farm that's right in front of it... and the volcano? Covered with clouds. At least it was quiet when we were there! 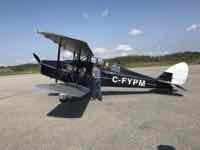 So... no antique-airplanes, but we still had just plane fun!